Some backward compatibility problem in proofreadpage? T185722: Implement a 'Page quality' log for Wikisource and wikis using Proofread Page.. If there are too many affected pages I could maybe add a category based fallback. Is there a way (using quarry or API) to identifu/count pages needing update? This may be as well 1000 as 10000 or 100000 of them. Ankry added subscribers: Bodhisattwa, Hrishikes, Mahir256, Billinghurst. I'm going to write a change to ProofreadPage that fallbacks to categories if the page property is not available. Had a play at enWS, and the touch becomes an edit on many occasions, maybe all occasions. That is a lot of edits. Fallback seems reasonable. Fallback have been implemented and merged into ProofreadPage. It is live now on https://en.wikisource.beta.wmflabs.org and will be deployed on Wikisources next Tuesday. 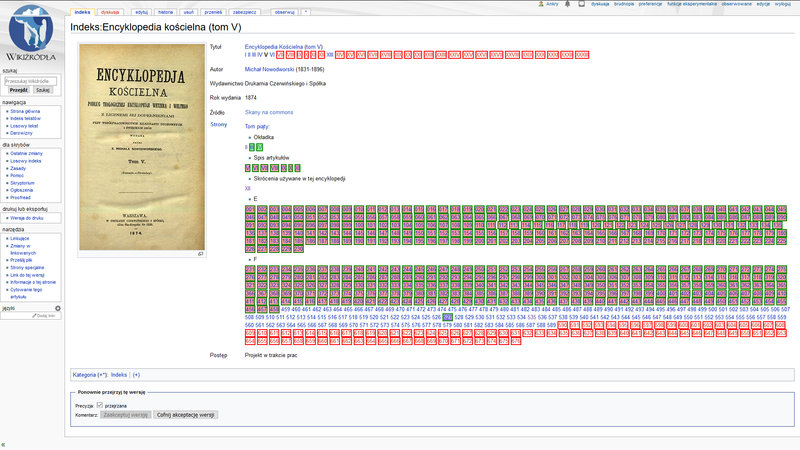 It seems that except de.ws, it.ws and zh.ws, in most wikisources 50-95% pages are affected. Workaround is a good point. However, I think that the bot job is also to be done at some point; not urgent now. Maintaining backward-compatibility code may be expensive ane leading to sudden unexpected problems while implementing new features. So I think it will be dropped in future. And many affected pages are pages verified years ago, so not intended to be touched except maintenance. We should wait until the fix is out next week, then have a systematic approach to resolving, and for every language wikisource. We can use wikisource-bot on toolforge for this task, it is one of the reasons that it was set-up, and has multiple operators. @Aklapper Is it possible to easily build a checklist (of the wikisources) within a phabricator ticket to ensure that we have done the tasks per wiki? If that capability exists, can you please point to some instructions. thanks. I have been through and merged the duplicates (csWS) and added the missing, predominantly teWS, huWS, knWS. for ps0 and ps4. [I note that some of the wikisources do not have a complete set of ps0, ps1, ps2, ps3, ps4 categories. ps0 and ps2 missing the most]. Just FYI: this task has already been done by me (AkBot) on pl.ws, de.ws and sourceswiki and by @Candalua (CandalBot) on it.ws. So these four may be omitted. Concerning eficiency, I did it with speed 2-4 per second with no measurable effect in database lag or job queue (and note: CandalBot operated on it.ws at the same time). en/fr ws are a bit larger, but I think 1-2 per second ratio would be safe also for them. I can also utilize my bot for this job if receiving bot flag on some wikis (it operates from two servers outside wikimedia infrastructure). The status in the index pages (on enWS) are currently broken because some pages were last edited long ago or for some reason do not have the status property set. There was a fallback supposed to be deployed a couple of days ago, but as far as I can see nothing has changed (e.g. https://en.wikisource.org/wiki/Index:The_Book_of_the_Thousand_Nights_and_One_Night,_Vol_1.djvu, which was all yellow before, now it's mostly white and <50% yellow). The solution is to modify (null edit or otherwise) the affected pages one by one, either manually or with a bot, which has been done for a few languages, but not for enWS. Is this correct? Any estimation when enWS could be done? Can I help? I have plans to start runs on enWS over the weekend on pages listed ps:0 and ps:4 category pages as the priority, and then if all is going well to progress to ps:2, ps:3 and ps:1 in that order. ps:1 are least urgent and I am guessing our biggest set. Depending on bot rights for others and what I can organise with the stewards, I will look to get to the others at an orderly rate. Small wikis we will just whack all the pages in a hit, the mids maybe I haven't got that far. though quite possibly the same, just not too many concurrent sets on the same underlying servers (which I have to check). As a comment, I think that there would be value in having a WIKISOURCE BOTS group that limits the action of our bots, and makes these things more readily manageable by us without concerns to the larger community. Unfortunately this week no Mediawiki deploy was scheduled. So the release of the fallback will happen with the next deploy, which should reach Wikisources on 11 July. General note: lots of these wikis are not on the global bots list. My request for rights for Wikisource-bot also has a rights for ratelimit derestriction alteration too. I am also leaving a note at each of these smaller wikis asking them to consider to opt-in to the global bots wikiset to allow these fixes to happen more easily and with a wider use of resources. Tpt merged a task: T198998: prop=proofread returns different content for different pages. Tpt added subscribers: Mpaa, Dalba. @Billinghurst Just FYI: for zh.ws it would be more effective (IMO) to go through pre-genarated page list than through all pages / selected categories. This is because relatively small ratio of pages is affected for this wiki. @Billinghurst, if needed pywikibot provides support for SQL queries, e.g. Strange.. I'm going to investigate. Thanks for the example! Sorry, I was wrong, the fix is not deployed yet. It should be deployed this evening UTC. @Tpt @Billinghurst The workaround seems to work. I confused. Is the issue resolved? It is necessary give the bot permission in wikisources for resolve the issue? Will it make only "touch" of Index pages? If the bot is nominated for get rights of global bot, then not need to give the bot permission in ruwikisource? Can just close nomination for bot in ruwikisource and other? Indeed, this was not clear as the initial problem was resolved using a workaround, but the source of this problem is not resolved. I've created another task T200118 for this. I'm wondering if it'd not be easier if we could do this server-side. Do we have a maintenance script that could purge/touch pages instead? Thanks. If there is such a script, there is also a question: how long will it take to make the decission to run it? If a week or two, then it might be easier; if few months or longer, then not.